In this article, Wet Fly Hackles, Part 1, fly fishing and tying authority Skip Morris discusses the debate about which materials are the best for wet fly hackles. In part 2, Skip shows you how to tie them, demonstrating three distinct approaches: the standard, half-stripped, and reverse-wound methods. The debate over just what sort of hackle is proper in a wet fly is nothing new. "Flies tied for use in fishing downstream usually have hard hackles, so that they will not mat and cover the body of the fly as it is drawn across and against the current. Flies tied for fishing up-stream have soft hackles, so that the hackles will readily respond to the influence of the current as the fly is carried down-stream without any action being imparted to it by the angler." Jennings clearly felt that the stiffness of wet fly hackles was an important matter. And he was right, so far as I am concerned. But I'm not quite on board with him regarding specifics. I fish wet flies all the time for sea-run cutthroat trout and Pacific salmon with the old toss-it-out-and-jerk-it-back approach—just the situation for Jennings's "hard hackles"—yet I prefer fairly soft-fiber hackles, because in between the jerks are brief pauses when supple fibers can billow out in a lively manner. When the wet fly is fished quietly—dead-drift or with the gentle across-current-soft-hackle-fly approach— soft, pliant hackle are the obvious and logical choice. So regardless of whether I plan to really work a wet fly across a current or lightly tease it across instead, I still want that fly to contain hackles with at least fairly supple fibers. This is why, in my opinion, dry-fly and most rooster chicken hackles are out, and why softer hen chicken hackles make sense. are nearly always softer than hackles from any part of a rooster. But I'm no expert on the subject. So I'd like to quote a contemporary devotee of the wet fly, my friend Dave Hughes. Dave's considerable research for Wet Flies, a skillfully written and ample exploration of the wet fly and related fly-types, coupled with his longtime fascination with the traditional wet fly and such relatives as the soft-hackle fly and the flymph make his opinions on wet-fly hackles well worth considering. So I gave him a call, and this is what he told me. While Dave prefers hackles that are exceptionally soft, such as partridge and hen saddle, for soft-hackles, he prefers the finest grade of hen neck for traditional wet flies. He looks especially for consistency of fiber-length and for sheen, the kind of sheen, he says, you find on a good dry-fly hackle. 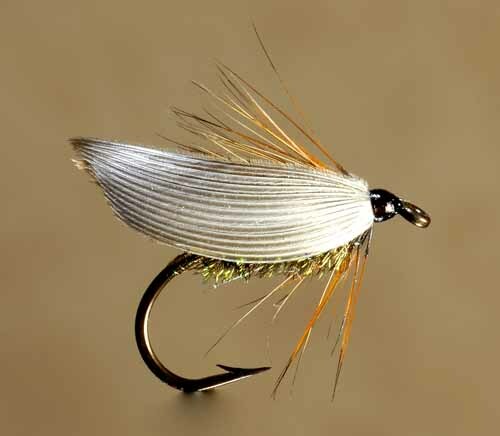 He also likes hen-saddle hackle as an alternate for especially big wet flies. Well, Dave's the expert, but nevertheless I'll add that for really big wet flies, such as the kind designed for sea-run cutthroat trout, I'm a big fan of Chickabou hackle, from Whiting. I'm speaking here of fly patterns that are not traditional wet flies, but many are so close to them in form that I thought it worth mentioning. Regarding hackle-fiber length, Dave says the norm is one-and-a-half to two times the hook's gape, just as with the traditional dry fly. But he prefers that his wet-fly hackles are a full two times the gape, the high end of the standard range. Remember: fiber-flexibility in wet-fly hackles is a fine point—no trout is going to refuse your Dark Cahill simply because its hackle fibers don't flex in just the right way. Still, every tier wants his or her flies to be their best, and the preceding should help you make sound choices in hackles for your wet flies. So, having selected your hackles, let's explore some ways to construct wet-fly hackle collars with them. There are several good methods for creating a wet-fly hackle collar, and though each method has its drawbacks, each also offers specific advantages. The standard approach of wrapping the hackle forward, then binding its tip, is the easiest. And it's probably just fine from the trout's perspective. The half-stripped hackle offers a very sparse collar—just right for persnickety trout and a dead-drift or barely manipulated fly. And only one simple step is added to the standard approach. The reverse-wound hackle isn't much more difficult to make than the standard, just a couple of quick extra steps. the fibers slant naturally back, and can be slanted further with a couple of quick pinches. The folded hackle is more involved and more time-consuming to make than the aforementioned types; describing it well really requires the space of a whole article, not just a little space in this one. But the folded hackle is worth investigating; perhaps we'll do so together in a future issue. Skip demonstrates each of the three methods he describes above for wrapping wet fly hackles in Wet Fly Hackles, Part 2, Tying Steps.